Following a recent string of impressive performances, Goalkeeper, Danny Sambridge has taken time out of his busy schedule to speak to the clubs Media Officer, Richard Buckby about his time at West Street so far, his impressive penalty saving record, another stab at the play-offs and more! Q1: Danny, you’ve been at the club for a while now having made your debut on Tuesday 30 October against AFC Sudbury. What have you made of your time at West Street to date? It’s been enjoyable, the boys were very welcoming when I joined which allowed me to settle in straight away. There is a clear hunger to succeed from both management and players, which was evident the second I joined. It’s a very driven environment to work in and one that for me personally has been enjoyable to be part of. Q2: Let’s talk about our recent performances… over the last eight games, we have only conceded three goals. 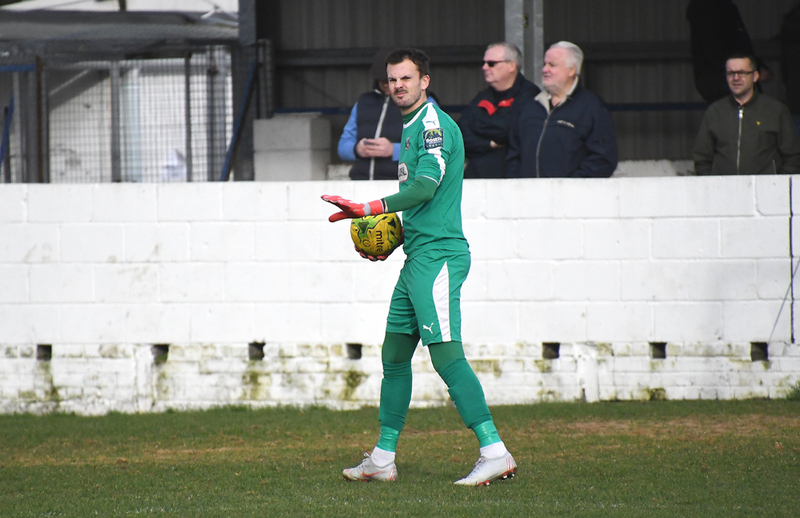 That run of performances saw Coggeshall collect the “Golden Glove” award for February – what do you put the recent improvements down too? We had a negative result away at Bowers at the start of the year which was probably the best thing for us, because whilst results prior were good, some of the performances could have been better. As a squad we realised we needed to get back to the standards we had previously set if we want to achieve our targets. The boys have been working extremely hard in training and now we are reaping the rewards on a match day – fingers crossed it continues until the end of the season. Q3: Following our mean defensive recorded, we have recorded seven wins in a row including one against your old side, Maldon and Tiptree on Saturday. What win stands out as being the best from your perspective? For me, it has to be Saturday’s win over Maldon and Tiptree. Take away the Colchester United link, Maldon have been a force in the division for a while, albeit they had one season when they nearly went down. To come away with a win there is always special, but to go to a local rival, a side with fantastic resources and that are chasing the leaders, to beat them 4-1 on their own patch is something to be proud of. 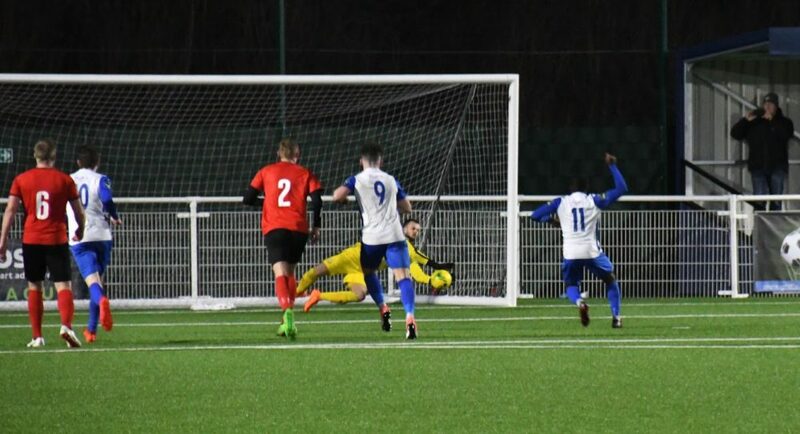 Sambridge is pictured, saving a penalty against Aveley in December. Q4: It would be wrong, to not mention you’re impressive penalty record whilst we have ten minutes of your time. Since you joined the club, we have conceded three penalties and remarkably, you have saved them all. That’s an amazing record for any goalkeeper, which I’m sure you’re very proud of. How do you do it? Research. I grew up watching Carlo Cudicini and Petr Cech save penalties for fun at Chelsea, so I spent a long time studying what they do, both the technical elements and psychological. It’s far more difficult to save penalties in non-league than in the Football League due to the lack of video footage available. So I essentially “profile” the penalty taker and based on that profile I will decided which way I dive, thankfully it’s paid off so far! There are a few factors that allow me to profile the taker but I only get a couple of seconds to make that decision. Q5: Away from West Street for a question or two… you’ve had a lengthy non-league career, but who is the best player you’ve played with and also, the best player you’ve played against? Majority of people that get this question will just say a big name they’ve played against, I’d rather choose players I’ve played with / against consistently and therefore this would mean in the Bostik division… In terms of played with, it has to be Glen Little at Heybridge Swifts. At 41 his ability to open teams up and retain possession was incredible. I remember being at home to Soham and Glen had possession in the corner of our defensive third. He put the attacker on the floor 3 times with the same trick and then slalomed his way through another three players and they thought he was just some old bloke! Against? Brad Warner. I think Brad has probably been one of the most dangerous forward players I’ve played against the last few seasons and I know he’s scored against me a few times. He’s about to win the division for a second year running as well! Q6: One of your old sides, who you just mentioned, Heybridge have recently announced their plans to install an artificial surface at their ground. There are now a number of clubs, within our division who play their home games on an artificial surface. What are your views on clubs moving away from grass pitches and do you see it having a major impact on the division? Personally, I prefer it. I like to play out from the back and therefore an artificial surface is far more conducive to this style. I think it promotes a better standard of football, it’s plays quicker and the current generation of players are all used to it now. We all train of 4G pitches so it’s no longer a surprise when you go to places like Aveley or Sudbury and play on their pitches. Then there’s the practical side to it, the threat of postponements are eliminated (unless it snows) meaning that the potential for a fixture backlog is minimised. I predict in the next 4 years 90% of the Bostik North will be playing on artificial surfaces. Q7: On Tuesday, we welcome Brentwood to West Street. They’ve pulled off some remarkable results this season, including being one of only two teams, to beat champions elect, Bowers & Pitsea. What sort of game are you expecting? I’m expecting a difficult game. Craig Shipman is a good manager who will be well organised and prepared. I know he likes his team to move the ball well, so I’m expecting a proper football match between two good sides. Q8: Our main goal this season was to achieve a play-off place and we are almost there. What excites you most about the potential of playing in the play-offs and have you experienced them before? This will be my 4th attempt at trying to win the play-offs. The opportunity to play in front of a large crowd and showcasing what we can do in the final is something that all players thrive on. But if I’m completely honest, it’s not something that’s on mind at the moment. It sounds so cliché, but personally I’m taking it week by week and concentrating on performing the best I can that week. For a goalkeeper, I think it’s important to stay grounded, don’t get too carried away with the high’s or too down about the lows. Play each game as it comes and I’ll certainly be looking to take that approach into the play-offs, should we get there of course.